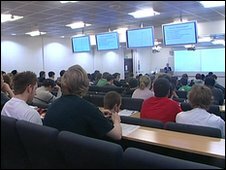 The government is to cut university funding in England by a total of £398m for 2010-11 compared with this year, Business Secretary Lord Mandelson said. In a letter to the Higher Education Funding Council For England (Hefce), he also asks universities to protect quality and access to higher education. His letter confirms efficiency savings of £180m and £83m - and makes a further £135m budget reduction. The Tories said they would make another 10,000 university places available. The government also wants to see more degrees completed over two years rather than three as a way of easing the funding crisis and to broaden education to a wider range of students. Fast-track degrees are accelerated honours courses, announced in 2003, which have been tried in eight English universities. Staffordshire, for example, has some 200 students - out of a total of 17,000 - taking two-year courses in accounting and finance, business management, English, geography and law. Students do the same amount of work as on a three-year degree but use the summer vacation as extra terms. Courses suit people such as mature students whose priority is obtaining a vocational qualification rather than having the full-blown undergraduate experience involving being away from home for the first time. They save on fees and living expenses, though with less opportunity for paid work. The government saves on the financial support students get in grants and loans (loans are repaid but over many years, and have to be funded in advance). But they cause universities financial problems. They have had to provide a three-year syllabus in return for two years' tuition fees and two-and-a-half years' equivalent in Hefce funding. There were organisational and infrastructure implications - such as extending the opening hours of student support and accommodation, library and information services. Some academics who were resistant could be side-stepped in a pilot programme but their attitudes would have to be changed if it were to be expanded. These Foundation and Fast-track degrees tend to appeal to those pursuing more vocational qualifications. The new reduced allocations are £84m taken from the capital funding budget, for buildings and equipment, and £51m from teaching. Among the £398m cuts, which were earlier incorrectly reported as being £533m, a promised £109m increase in research funding is maintained. But Lord Mandelson also says some universities have recruited more students than they should have - so asks the Hefce to claw back £3,700 per student where this has happened, to cover the costs of their financial support. The million+ university grouping estimates this might amount to £60m overall. Lord Mandelson's letter makes it clear that last year's U-turn on extra student numbers was a one-off "responding to the particular needs of the time" - that will not be repeated in 2010-11. There was a public outcry about the numbers who would not get places, especially when more people wanted to go to university. The popularity of higher education has been attributed in part to the lack of alternatives in the recession. Shadow universities and skills secretary, David Willetts, said of the over-recruitment penalties: "We now have the bizarre situation that universities are being fined for meeting targets set by this government. "This year as a combination of a demographic bulge and the recession, more young people wished to attend university. "Unlike the government we don't believe in artificial targets. Our view is that higher education should be available to all those who are qualified by ability and attainment to pursue them and who wish to do so." He said a Conservative government would offer an additional 10,000 more, fully-funded, university places to enable more young people to enter university next year. 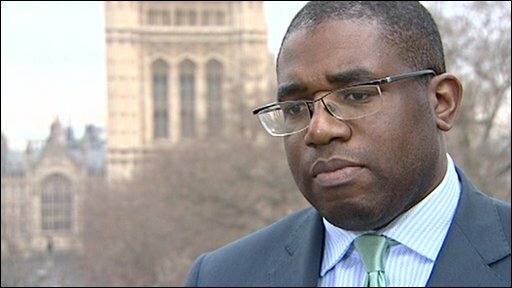 MP David Lammy: "We are making a small 1% cut in funding"
The vice-chancellors' organisation Universities UK said the higher education sector understood the current pressures on public spending and was playing a key role in tackling many of the long-term challenges facing the economy. But these cuts would put universities in England under severe pressure. "A reduction in the public funding per student could seriously threaten our ability to offer the high-quality experience our students deserve and expect," said its president, Professor Steve Smith. And he noted that it was the rising cost of student support in the recession that was causing much of the funding squeeze - making the ongoing Browne review of student finance all the more important. Higher Education Minister David Lammy said: "The efficiency savings were less than 1% of the total teaching grant. "Teaching is protected because this government recognises that a high quality student experience with excellent teaching and research is vital to maintaining the world-class higher education we enjoy in this country today. "Fast-track, part-time and two-year degrees do not represent a reduction in quality in the higher education offer, but an increase in choice for the would-be learner. "In the current economic climate, it was not a question of whether efficiencies should be made, but of where the efficiencies should be found." The University of Buckingham - the UK's only private university - welcomed the cuts. "It was by such cuts that the US created its Ivy League, which is the world's best university system," it said. But Sally Hunt of the UCU academic union said: "The Hefce grant letter is a real Christmas kick in the teeth for staff and students and final proof that the government has completely lost its way when it comes to higher education." The Scottish Government's draft budget, published in September, saw a real terms increase of 2.1% in university resource budgets.